At the age of 23, Zainab Salbi founded Women for Women International, a grassroots humanitarian and development organization dedicated to serving women survivors of wars by offering support, tools, and access life-changing skills to move from crisis and poverty to stability and economic self-sufficiency. Under her leadership as the organization’s CEO (1993-2011), Women for Women International grew from helping 30 women upon its inception to more than 400,000 women in 8 conflict areas. It also distributed more than $100 million in direct aid and micro credit loans that impacted more than 1.7 million family members. 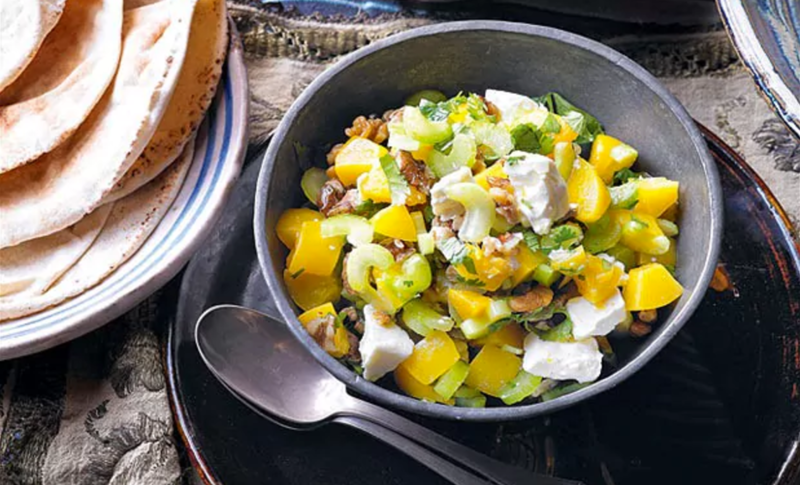 The recipes from the book come from both the women living in the war-torn countries in which WfWI operate, humanitarians, and celebrity chefs like Alice Waters, Maggie Beer, and Hugh Fearnley-Whittingstall. You can get the book, Share, here (x). I am the kind of cook who is constantly inventing and revising. I could never follow a recipe, but constantly make new recipes for myself. I just open the refrigerator, see what inspires me and go from there. The look of a dish is as important as its taste for me. My mother used to always tell me, ‘The eyes eat before the mouth’, and I follow this rule religiously. I go to a camp every year where there is no electricity or running water. It is a complete immersion in nature and, as there is no stove, most meals comprise salad and grills. It is my favourite time of the year when all my cooking creativity comes through, surrounded by beautiful lakes and the quietness of nature. Thinly slice the celery and roughly chop the walnuts, and place in a serving bowl. Peel and stone the peaches and cut the flesh into cubes. Add to the serving bowl. Add the feta and coriander. Gently mix together, then drizzle with the olive oil and lemon juice. Season with salt and freshly ground black pepper and serve.